Our walk started at Canada Water, a small freshwater lake and wildlife reserve in central Rotherhithe that was once the site of a nineteenth century ‘timber pond’. Originally constructed by the Grand Surrey Dock and Canal Co., ‘Canada Pond’ was absorbed into the much larger Canada Water Dock which opened in 1876. This dock was built by the newly formed Surrey Commercial Dock Company to handle large iron vessels specialising in the thriving Anglo-Canadian trade of grain and timber. When the trade finally fell away and the dock closed in the 1970s the whole area was regenerated. A small section of the dock was retained for the wildlife reserve but most of it was filled in and now sits under the Surrey Quays Shopping centre and car park. The walk continued round the lake and down a passage leading to Surrey Quays Road and thence onto Redriff Road, which overlooks Greenland Dock. 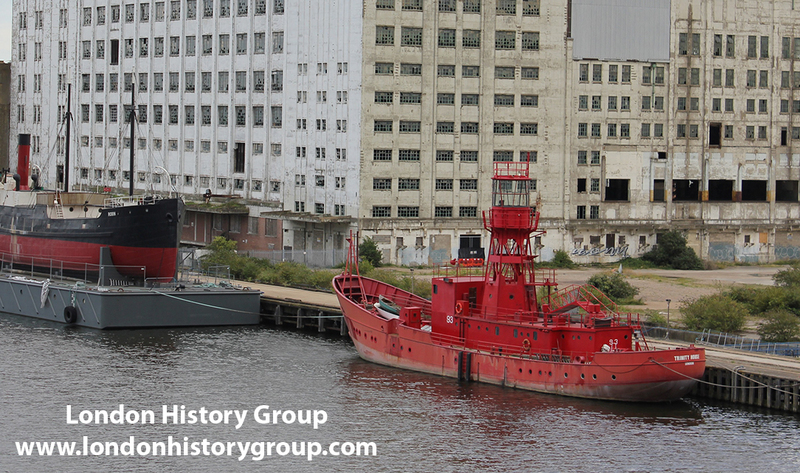 Here we passed a large red lifting bridge which once covered a waterway cut from the Greenland Dock to Canada Dock. Greenland Dock itself is arguably the most impressive reminder of London’s dock history. Originally called the Howland Great Wet Dock it was built in 1699 as a re-fitting base where ships could be repaired and berthed in a sheltered anchorage. From the 1720s, Greenland whalers also used the dock and extensive usage by the whalers led to its’ renaming as the Greenland Dock. In 1806 the dock was sold to William Richie, a Greenwich timber merchant and founder of the Commercial Dock Company (1807). In 1904 it was greatly expanded and the lock enlarged to provide access for ships up to 15,000 tons. We walked round the dock to the point when the Grand Surrey Canal, built in 1810, once passed on the western side en route to its exit in the north of the borough. When the Greenland Dock was extended across the route of the canal all cargo destined for its Surrey wharves came in through the Greenland Dock and entered the canal through a new lock introduced on the southern side. We left Greenland dock via Greenland Quay and turned left into Plough Way. Passing the site of the old Baltic quay we entered South Dock, which is now a marina. This dock, built in 1807–1811, was originally called the East Country Dock. It was renamed in 1850 when the Surrey Commercial Dock Company purchased and enlarged it. Severely damaged during the Second World War, it was drained in 1944 and used as a workshop to manufacture components for the famous Mulberry Harbours. It then re-opened but struggled to survive and in the 1980s it was developed as a marina. 1888 plan of the Victualling Yard. Copyright National Archives. Leaving South Dock we crossed Plough Way into Grove Street and the entrance a few yards down to the Royal Victoria Victualling Yard. Grove Street appears to have changed its name more than once. Originally called Grove Lane, it then became Grove Street. For a brief period in the late 19th century, at the bequest of Queen Victoria, it was renamed Victoria Street at the top and Albert Street at the bottom. Grove Street was home to many of the victualling yard employees. The yard itself and the work carried out by the Victualling Office is described in some detail in Sue’s presentation of 13th March this year. 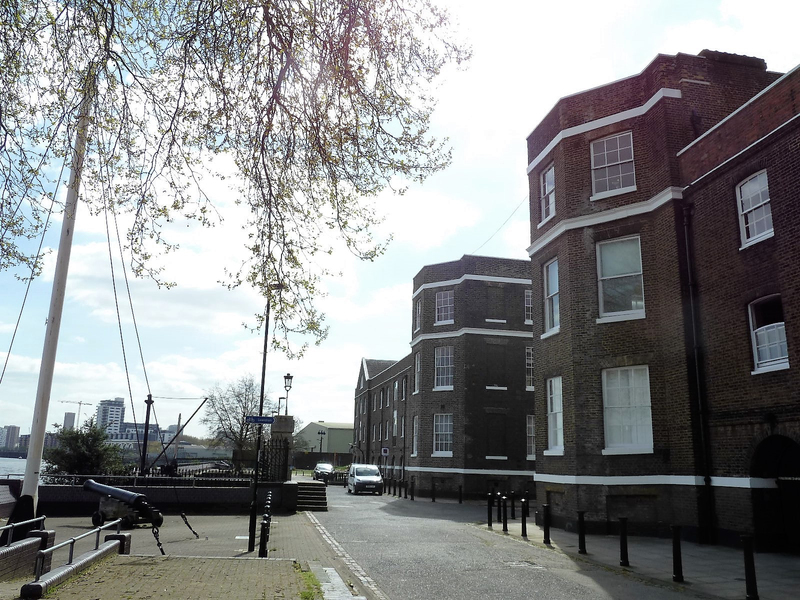 Our walk gave members the opportunity to see at first hand a number of buildings erected in the late 18th century when the Admiralty officially moved the Victualling Office and all its activities from Tower Hill to Deptford. The first of these buildings, all of which are now listed, is the main entrance gate off Grove Street. Built circa 1768, probably by Samuel Wyatt, it remains virtually unchanged, although the entrance now has two white arches joined by a lamp holder instead of its original large iron gates. Just inside the gate is the Colonnade Building, built some ten years later to accommodate naval officers. The attractive two blocks of two storeys, named for their imposing colonnades, would have been occupied by naval officers who were civilian employees of the Navy Board, not sea officers. In the 1960s they were converted into flats by the Greater London Council. Walking eastward through the Pepys Estate, a social housing complex built by Lewisham Council, we came to an elegant row of houses, simply called ‘The Terrace’, which was built in 1791. The terrace of 7 houses, each with three stories and a basement, was also converted into flats with some internal features remaining. 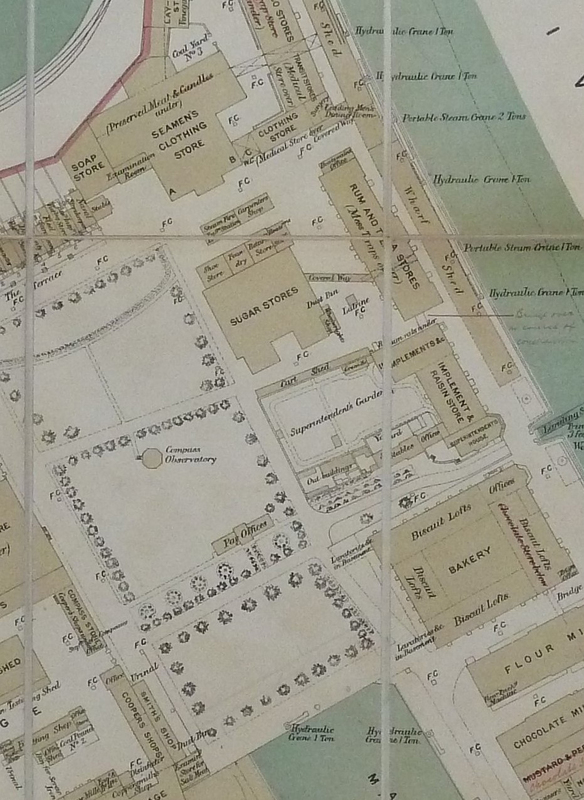 According to an 1888 plan of the yard, which can be viewed at the National Archives, each house was allocated to one of the senior yard officials. Continuing along Longshore past the terrace we soon came to the riverside which still retains some of its eighteenth century features, not least the river wall itself which is also a listed historic ‘building’. The wall had collapsed during the Napoleonic Wars and was rebuilt by John Rennie in 1816. Turning right along the riverside we quickly reached two fine large warehouse buildings. Historic England records that they were built in 1781-98 and that ‘the inner returns of the buildings and 3 bays of main fronts, were formerly the Commandant’s House and the Administrative Offices’. The 1888 plan of the yard shows that the rest of the buildings were given over to the bakery and biscuit lofts on one side and an implement and raison store on the other. This contradicts the widely held belief that these two buildings were in fact rum stores. On the riverside, facing these buildings, are the Royal Victoria Yard River Gate and stone steps with wrought-iron gates between stone capped piers. Turning away from the river and walking down between the two warehouses we passed 3-5 Foreshore, the last of the listed buildings which was previously a stable block. Many of the old buildings on what was eventually a 35 acre site have vanished without trace. However, those that remain – when studied alongside the detailed 1888 plan of the yard – provide a vivid picture of the yard at the end of the Victorian era. All this land was once part of the Red House Estate, owned and nurtured by the diarist and polymath John Evelyn in the 17th century. It was appropriate therefore to end our walk in Sayes Court Park at the bottom of Grove Street, the small piece of land that is all that now remains of John Evelyn’s famous garden. This entry was posted in All, Guided walks on July 16, 2017 by Andie. Our walk today started at Poplar Baths, a recently restored 1930’s swimming pool and moved into Chrisp Street Market, the hub of Neighbourhood Number 9 or the Lansbury Estate, a showcase 1951 housing estate which was the Live Architecture Exhibition of the Festival of Britain in London. The estate was designed to replace bomb-damaged and substandard housing in the post-war years and to create a whole new, well-planned and well-built neighbourhood for the local community with a shopping centre, schools, churches, green spaces and public art. 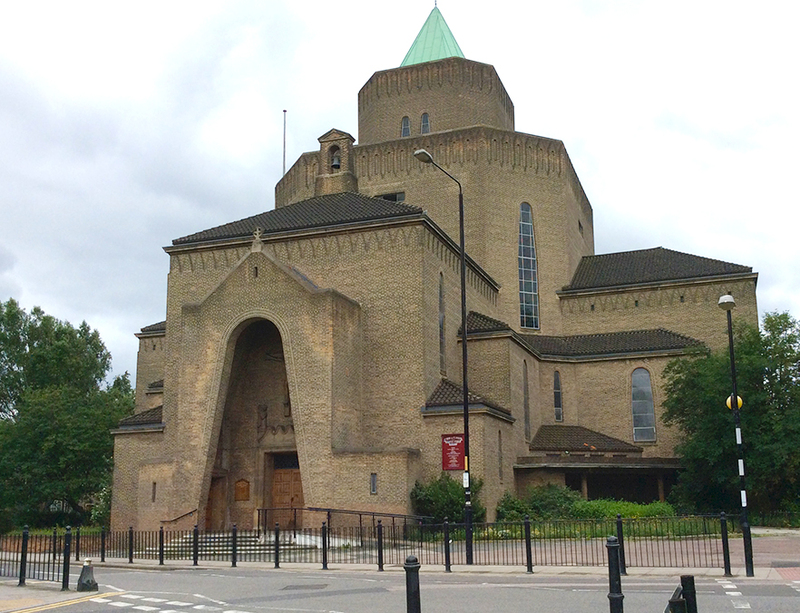 When the Lansbury Estate was planned, there was full employment in the local area and no immediate question mark over the future of the London Docks, hence planning was for housing for families and the whole age range, including London’s first new nursery school and first old people’s home, innovative school and church designs, notably Lansbury Lawrence Primary School with its striking Peggy Angus mural and the Catholic Church of St Mary and St Joseph designed by Adrian Gilbert Scott. Father Keith gave the group a warm welcome and let us climb the 120 steps up to the roof from where the views of East London, Canary Wharf and the City were outstanding. As the docks declined in the 1960’s, many local families were tempted to move out of London to the New Towns of Harlow and Stevenage and the estates around the expanding Ford works in Dagenham. 10,000 jobs and an equal number of residents left Poplar when the docks closed in the 1960’s and 70’s, bringing many economic and social challenges. The regeneration of the area into the business district of Canary Wharf in the 1980’s was often thought to exclude local people, with its focus on banking and trading. However, the area continues to be a vibrant, mixed community with new housing still in great demand. Memorial to 18 children killed at Mayflower Upper North Street School in Poplar on 13 June 1917. Photograph by Sue Flockton. The Lansbury Estate is also the location of the Mayflower School on Upper North Street where, exactly 100 years ago on 13th June 1917 the first bomb to be dropped from a fixed-wing plane fell on the school, killing 18 young children. It had a huge impact on the people of Poplar who would later endure heavy bombing in the Blitz. 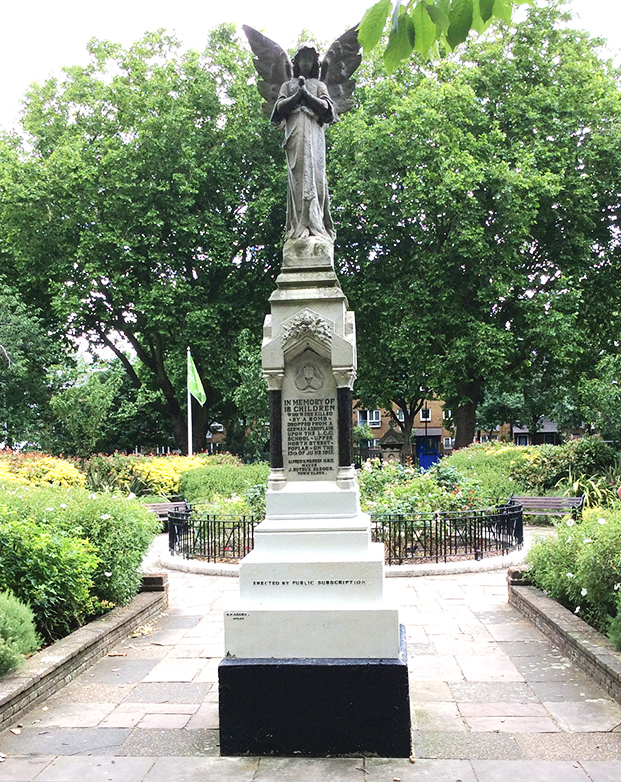 Having seen the school, we went to the memorial in Poplar Park where, by great good luck, we met a group of descendants of the victims of the tragedy being interviewed for a news programme and the organiser of the reunion told us about the centenary events. The anniversary will be commemorated this week with a visit from the Queen to the school and to a service in the church of All Saints Poplar with the German Ambassador and local people. Our visit ended back along East India Dock Road, the link road from the City to the East India Docks, before arriving back at Chrisp Street Market. The Victoria and Albert Museum recently opened a micro-museum in Chrisp Street Market and are involving the local community in the history of their area and helping it to look to the future as a cultural quarter is planned for the Olympic Park in the coming years. The spirit of the Festival of Britain still lives on in Neighbourhood number 9! Our thanks to Fran for a an excellent walk, well planned and full of interest, in an area previously unknown to many of us. It provided a real insight into 1950s planning. Lansbury Lawrence Primary School. Photograph by Sue Flockton. This entry was posted in All, Guided walks on June 12, 2017 by Andie. Emirates Air Line. Source: Nick Cooper at English Wikipedia, CC BY-SA 3.0. 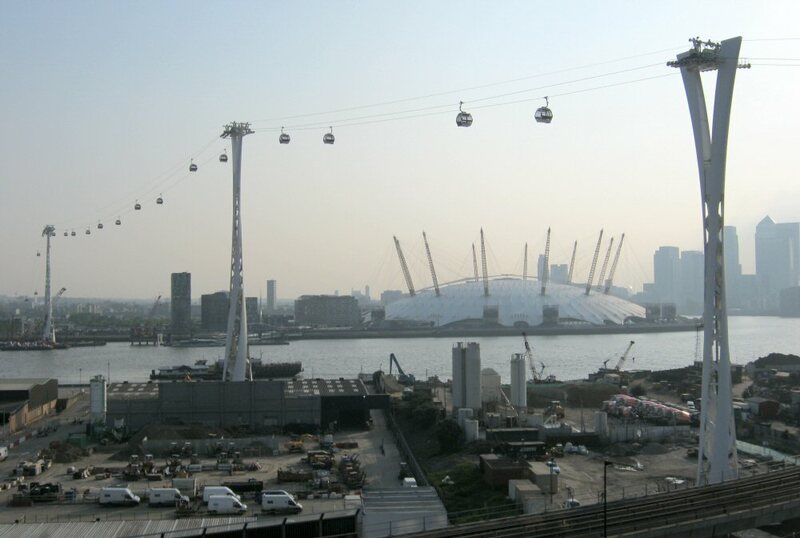 This week our guided walk included an unexpected adventure: our trip started with a ride on the Emirates Airline cable car, which took us from North Greenwich to the Royal Victoria dock to enjoy the views of the Thames, the Thames Barrier and the docklands areas. Arriving at Royal Victoria Dock, we strolled along the water side towards the Excel centre. The Royal Victoria Dock was built on Plaistow marshes – a place of smuggling, illegal prizefights, gibbets and prison hulks on the river. The1844 Metropolitan Building Act restricted the use of populated areas for noxious industries so the area became attractive to such industries. The land was acquired cheaply and industrial development began with the building of the North Woolwich Railway (from Stratford) which opened in 1847. The Victoria Dock was constructed 1850-55 and was designed to take the new large iron steamships. The indented shape gave increased docking space. It was equipped with hydraulic lifting machinery, newly introduced by Sir William Armstrong, which gave it an advantage over existing docks. The entrance was from the west (now blocked by Silvertown Way) and land was bought to the east in order to build the Albert Dock and an eastern entrance. “Royal” was added to the names in 1880 when the Albert opened. Stothart and Pitt cranes from 1962 remain as a feature of the redeveloped dock. The Royal Docks specialised in the import and unloading of foodstuffs and were lined with granaries and refrigerated warehouses. The docks closed in 1981. Near Excel we viewed the Dockers statue by Les Johnson, installed 2009, and the remaining warehouses which were mostly bonded stores for tobacco. Here also is the Transporter Bridge designed by Lifschutz Davidson in 1997. Originally it was planned to have a passenger cabin underneath. However the lifts no longer operate, so we continued along the dockside to view more of the dockside features. Overlooking the dock are the Spillers Millennium Mills built between 1933 and 1954 and was one of many granaries which lined the Royal Victoria Dock. It has been derelict for many years, but there are plans for development into flats. Within the dock itself, ships include Lightship 93, built in 1938 at Dartmouth, ordered by Trinity House in 1938 built by Philip & Son of Dartmouth and named Light Vessel 93. She is now privately owned and is used under her present name as a photographic studio. The nearby SS Robin is the world’s oldest complete cargo-carrying steam coaster and the last of her type in the world. She was built in 1890 at Orchard Yard, Bow Creek, on the River Lea and was restored between 1974 and 1975 by the Maritime Trust. The DLR from Prince Regent station took us via Canning Town to Pontoon Dock station, with views of Silvertown and the Lyle’s Golden Syrup factory. 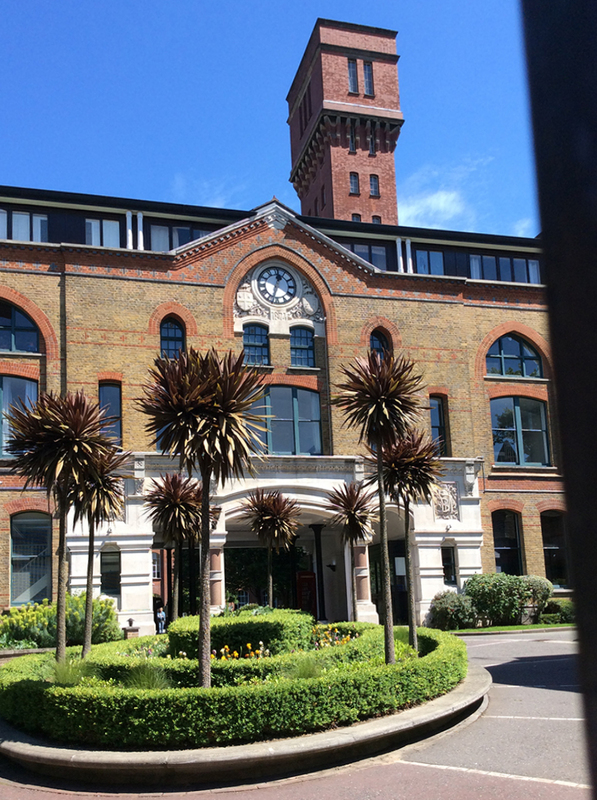 Founded by Henry Lyle, the factory amalgamated with Tate in 1921 to become Tate and Lyle’s. Lyle Park nearby was given to the workers and local people by Henry Lyle 1924. Inside are the gates from the Harland and Wolff shipbuilding yard in North Woolwich. Silvertown itself was named after Stephen Winckworth Silver who opened his India Rubber, Gutta Percha and Telegraph works here in 1852. Many other industries in Silvertown included several manure works, Knights Castile soap, James Keiller’s preserves, and Silvertown lubricants (which refined Russian crude oil). Charles Dickens described the area as “a refuge for offensive trades, oil burners, varnish makers, printers-ink makers and the like”. 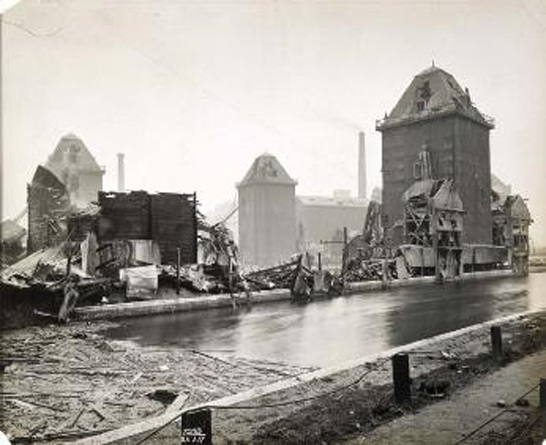 In 1917 Silvertown was the site of the terrible Silvertown explosion. The Brunner Mond Chemical Works here made soda crystals from ammonia and caustic soda. During WWI they were asked to convert to produce TNT for the war effort. They were reluctant as there were 30,000 residents in the area, a school and a church, but eventually had to agree. On Friday Jan 19th 1917 a fire started in the melt pot room and caused the largest explosion ever experienced in London. 69 were killed and 2000 made homeless. The blast was heard on the south coast. It was probably caused by poor safety procedures. The memorial to the victims has now been moved into the new housing development at Royal Wharf and was too far to walk to on this occasion. Pontoon Dock station gives good views over the area. Pontoon Dock was originally the Victoria Graving Dock for ship repairs. It was equipped with a revolutionary ship lift and opened in 1858. The ship for repair was lifted out of the water on pontoons by hydraulic jacks, and lowered into the repair docks. By 1896 the ships were too large and this dock closed. 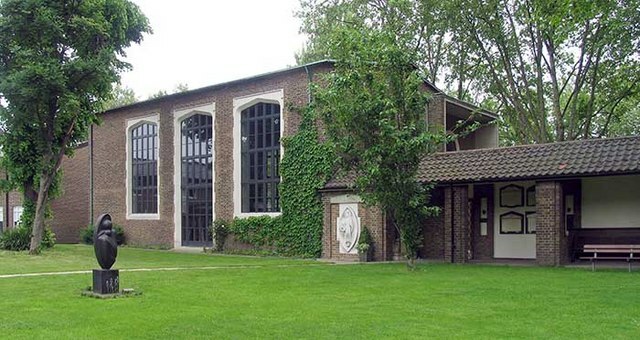 Another notable feature is D-Silo, a former Grain silo, built of reinforced concrete 1920. Bulk grain was lifted from ships and barges into the central silo and 2 side towers by bucket and suction elevators. From here we entered the very attractive Barrier Park with its 400 metre long “green dock” (never actually a dock). The park was developed by LDDC and opened in 2000. It was built on one of the most polluted sites –PR Chemicals. Decontamination took years. At the riverside there is a Pavilion of Remembrance to civilians who died in World War II. Here we viewed the Thames Barrier, constructed 1974-82 and became operational 1984, before returning to the park café for lunch. We all thank Sheila for an excellent and superbly thought out walk. It was scenic at both the start and finish and thoroughly interesting in between! A true microcosm of 19th Century east London. The café overlooking the park made a relaxing place to finish. 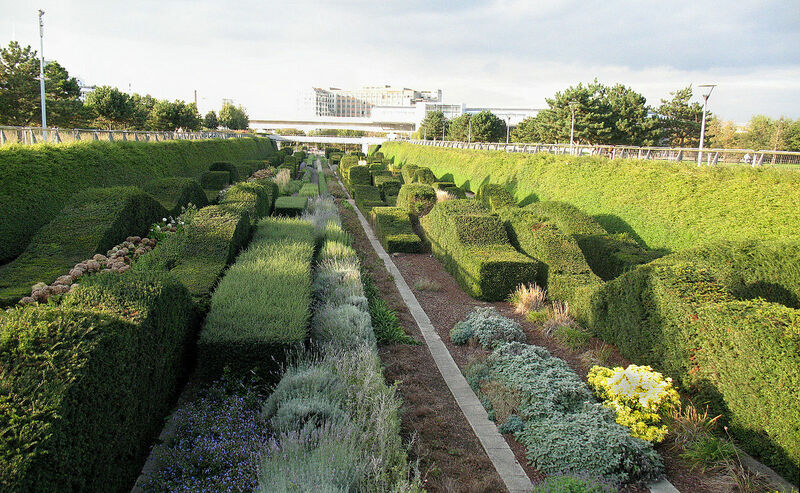 Thames Barrier Park by Alan Stanton. CC-BY-SA-2.0. Wikimedia Commons. This entry was posted in All, Guided walks on June 6, 2017 by Andie. Perhaps less historically glamorous than Spitalfields or Whitechapel at present, Bow is a fascinating area at the far end of the Mile End Road. Both Bow and neighbouring Bromley grew up as settlements close to ancient fords on the River Lea. Bow was probably named after a “bow” shaped bridge built in 1110 by Matilda, wife of Henry 11. 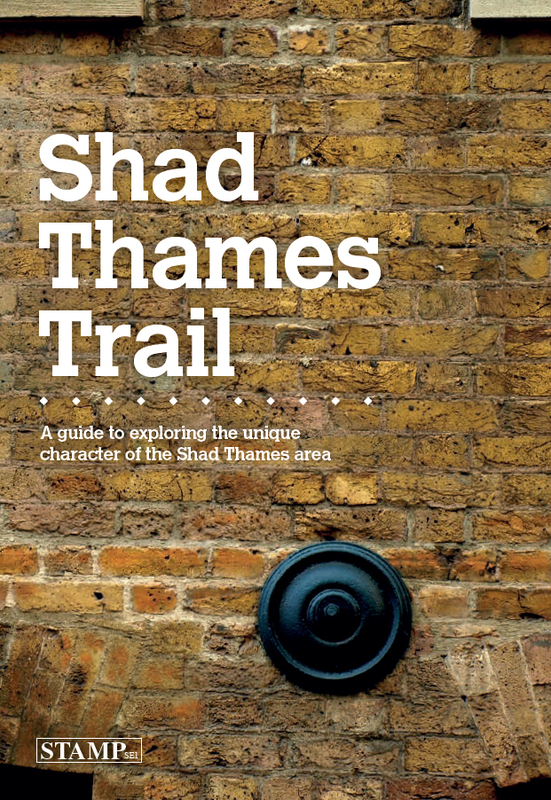 She needed to cross the River Lea to survey her own estate lands and to visit Barking Abbey. The Bow crossing superseded the Roman crossing at Old Ford and led to Stratford – literally “the paved way to the ford”. In 1966-7, the Greater London Council (G.L.C.) built the current bridge and flyover leading from the Blackwall Tunnel. It is hard to believe that both Bow and Bromley – the latter was always the lesser settlement – were once rural hamlets of great charm and desirability on the far outskirts of the City. St Mary’s Parish Church, Bow. Photograph by Sue Flockton. The land seems to have been quite marshy. In 1311, the people of Bow petitioned for their own chapel of ease rather than take the awkward and muddy journey to St Dunstan in Stepney. In 1719 St Mary’s became a parish church in its own right. Isolated now on a traffic island opposite the Nunnery gallery, it once formed part of a street of historic buildings, all of which have disappeared. 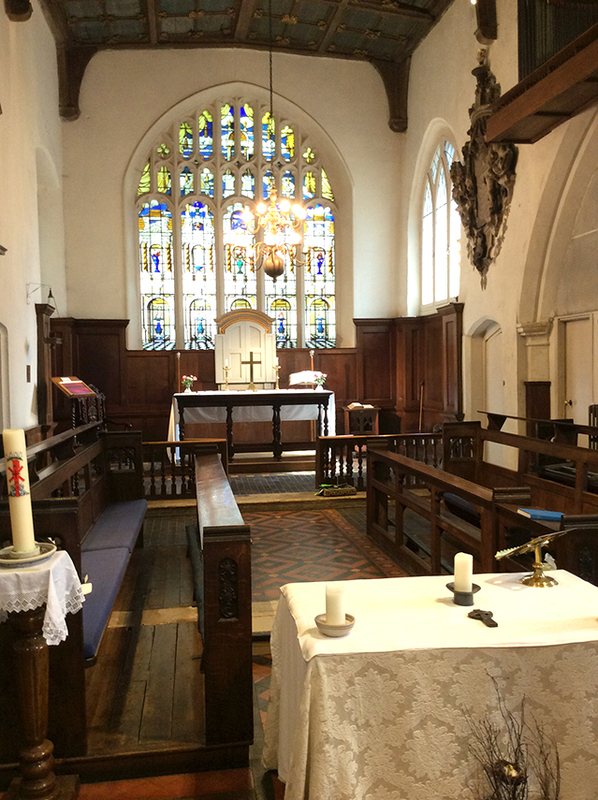 We were able to visit the Church and view the parish room designed by C.R. Ashbee, who ran the Guild of Handicrafts from a 17th Century house lower down Mile End Road towards the City. Appalled by the destruction of historic Bow in the late 19thC, Ashbee started the Survey of London in Bow in 1896 with the intention of recording the fine buildings being demolished at that time to make way for the new factories and worker housing. 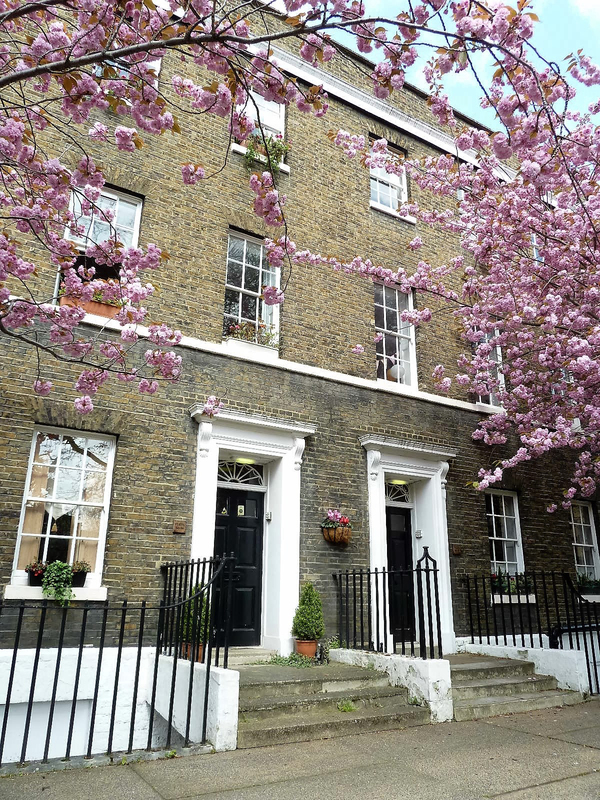 The Nunnery Gallery run by Bow Arts since 1996 is on the site of one of these historic mansion houses dating from the 17th Century. Sophie Hill, the Director, introduced us to the current exhibition there, called “Raw Materials.” She explained that this was an Heritage Lottery Fund funded project created to look at the vanished industrial heritage of the Lea Valley. It focused on wood with a special emphasis on the furniture trade. The exhibition presented an evocative mix of objects – furniture, tools, printing blocks for wall paper – archive materials, maps and photographs as well as oral testimonies and the work of a commissioned artist, Silke Dettmers who created new pieces especially for the exhibition. There were also carefully crafted pieces from the Building Crafts College in nearby Stratford – a training college sponsored by the Carpenters Company, which owned lands in Stratford nearby on the Olympic site and whose name is remembered in the nearby Carpenters Road. The River Lea, which runs close by Bow, was edged with large timber yards – for example, Gliksten & Sons Ltd, E. Sherry, James Latham Ltd, and Bambergers. All took in timber supplied from the Surrey Docks and brought up the River Lea by canal. It was used in a variety of ways – for packing cases, building materials and matchsticks. The project looked particularly at the production of furniture in the East End. It traced the history of small scale factories in the Shoreditch area, often run by immigrant Jewish families, to the development of large scale concerns – most particularly Lebus which moved from small premises in Curtain Road to a vast factory site next to the River Lea at Tottenham. Lebus was once a supplier of furniture to all corners of the British Empire, a maker of aeroplanes in two World Wars and a major supplier and developer of Utility Furniture. An enlightened and major employer in the area, it did not survive the 1970s and very little remains on site. 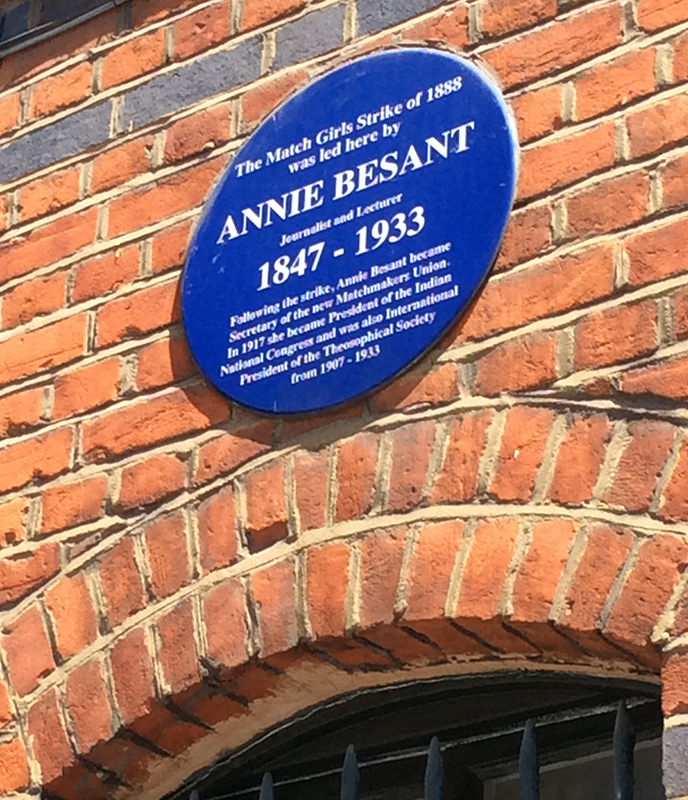 Blue plaque commemorating Annie Besant and the Match Girls Strike. Photograph by Sue Flockton. Bryant and May were also a major manufacturer in the Bow area producing matches on site from 1862 to 1979. Two Quakers set up the business using Swedish technology and bringing both timber and chemicals down the River Lea. Poor working conditions and dreadful exploitation led to the Match Girls Strike of 1888. The present vast red brick complex was built as a new factory in 1910-1911 and produced 10 million matches a year. When it closed in 1979, the buildings were eventually re–developed as The Bow Quarter by O.R.M.S. Architects in 1987. Today it houses 733 one and two bed room apartments. We were able to look beyond the gates and visit the courtyard to view inside the complex. The walk continued past the nearby tram shed built by the London County Council in 1907-8 and now used as a bus station. On the corner of Fairfield Road – so named after the annual Whitsun Fair re-located to Bow from the west End in 1764 but closed in 1862 – stands Poplar Town Hall. One of the important public buildings located on Bow High Street, it is now used as office space and a café. Designed by Clifford Culpin in 1938, it is a reminder of Bow’s proud past and association with the Docks. Mosaics above the entrance show wine, sugar and other Empire produce. Across the road, stands Bromley Public Hall which was the former vestry hall for nearby Bromley and is now the Tower Hamlets Registry Office. The nearby Police Station at 111 Bow Rd was built in 1903 and added to in 1937-8. The Thames Magistrates Court stands opposite replacing an older Court House and designed by Phillip Arrand in 1990. The Bow area was once the site of three railways. There are hints in the names of streets and in the name of The Little Driver pub – although not everyone agrees on the latter. The nearby Tredegar Terrace, rebuilt as a training school for nurses in 1911, was once the home of Joseph Westwood. A builder of iron ships and bridges across the Empire, Westwood is buried in a grand tomb in Tower Hamlets Cemetery just down the Mile End Rd. He is a reminder of the importance of Bow in the past, when it was once not just a place to pass through en route to leaving central London. To visit the Raw Materials website go to rawmaterials.bowarts.org. Our many thanks to Jill for organizing and hosting a really excellent day. Bow Quarter. Photograph by Sue Flockton. This entry was posted in All, Guided walks, Visits on May 22, 2017 by Andie. 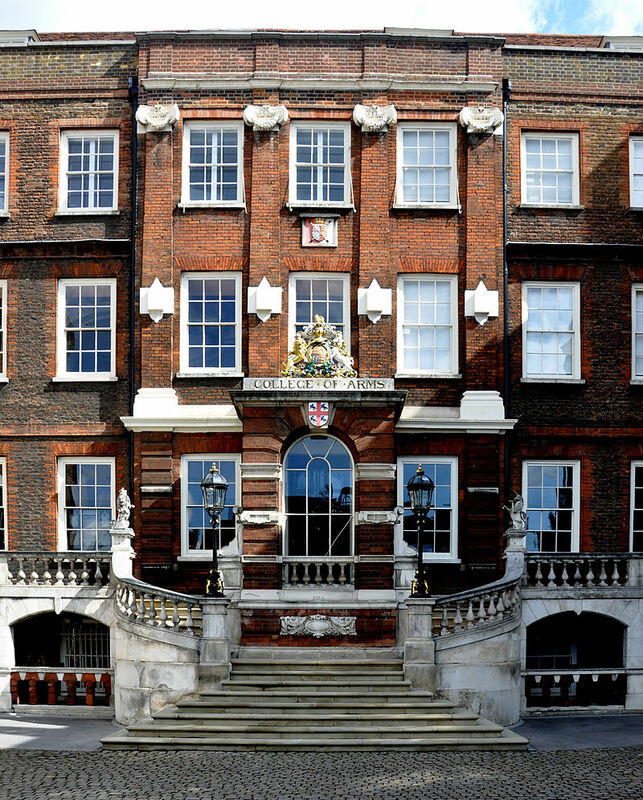 College of Arms. By Andreas Praefcke, CC BY 3_0. Our second guided walk of the season started at Blackfriars Station. We proceeded along the Thames Embankment, pausing to admire the College of Arms which is a fine, late Georgian building with its attractive gold leaf gates and its startling embellishments, situated half way between the bridge and St Paul’s Cathedral. Crossing the Millennium Bridge, heading south towards the imposing presence of the Tate Modern, we went to inspect the house where St Christopher Wren is often purported to have lived whilst St Paul’s was under construction, along with several other famous names from the 17th Century. But all is not as it seems, because the house actually dates to Queen Anne, was erected in 1710, and the plaque over the door appears to have been a romantic twist dating to 1945. Heading east, we passed Sam Wanamaker’s modern Globe Theatre replica into Park Street where the Blue Plaque on the wall proudly boasted the site of the Elizabethan Rose Theatre, where despite the modern frontage plays are performed in a time-warped atmospheric setting. Just beyond, partially under Southwark bridge, is the original site of Shakespeare’s Globe. There is a very good description of the site and the development of the theatre on the display boards, explaining that the theatre is known as “Shakespeare’s Globe” not merely because his plays were performed here, but because it was built in 1599 by Shakespeare’s company of players, the Lord Chamberlain’s Men. We then continued to Clink Street under the railway arches and to the remains of the great hall of Winchester Palace with its magnificent medieval stone rosary window. The famous Clink Prison dates back to 1144 was one of England’s oldest prisons, spanning over 600 years of history. In its heyday, it was in fact a dungeon – part of the Winchester Palace estate – that provided accommodation for those who displeased the Bishop. It is now open to the public as a tourist attraction, showcasing some of the darker and more gruesome stories of life in Medieval London. A replica of Sir Francis Drake’s astonishingly small and brightly coloured galleon Golden Hinde greeted us next, always a remarkable sight as one turns the corner from the Thames Path. The information boards gave informed us that he had navigated under the orders of Elizabeth I to negotiate new trade agreements with nations never before encountered, to acquire land, to discover new shipping routes and to acquire treasure from Spanish ships. This project, led by Drake, who was accompanied by five other ships, was designed to undermine Spanish dominance in South America and improve British links across the globe. thereby weakening the Spanish dominance of South America. He did this successfully, and to liberate treasure from Spanish ships. As well as securing around £600,000 in Elizabethan money, Drake was the first navigator to successfully circumnavigate the globe. He was knighted by Queen Elizabeth aboard the Golden Hinde. 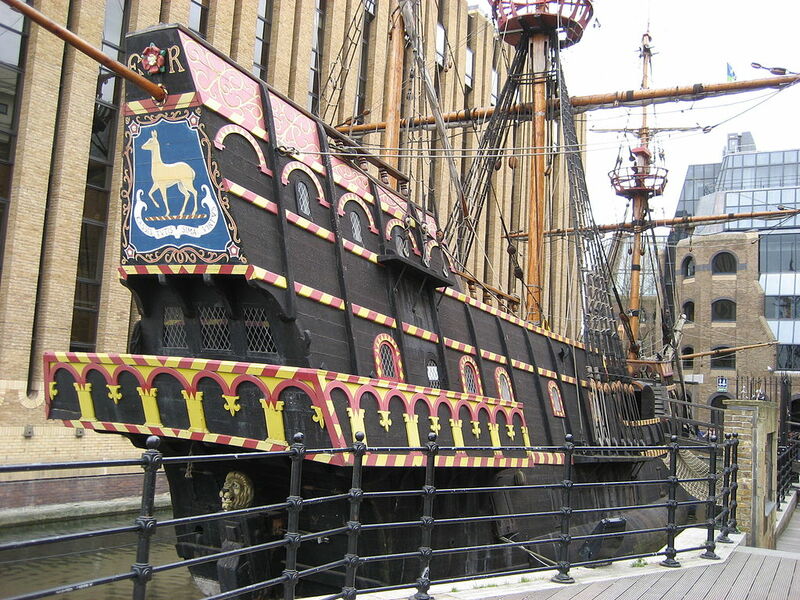 Although it was intended that she be preserved as a museum to commemorate the Queen’s achievements, Golden Hinde was not maintained and had disintegrated by the mid-17th century. Today it is a popular tourist destination and wedding venue, due both to its novelty and its link to an important historic event. Tracing our way through the streets behind London Bridge we entered the precinct of Southwark Cathedral. This beautiful majestic and imposing monument, with its colourful effigies, is London’s oldest and finest Gothic structure. From the early 1100s it was the church of the Augustinian Southwark Priory, dedicated to the Virgin Mary. It was badly damaged in a fire of 1212 and the following rebuild gave it its present form. Following the dissolution of the monasteries in the 16th Century, it became a parish church dedicated to St Saviour. 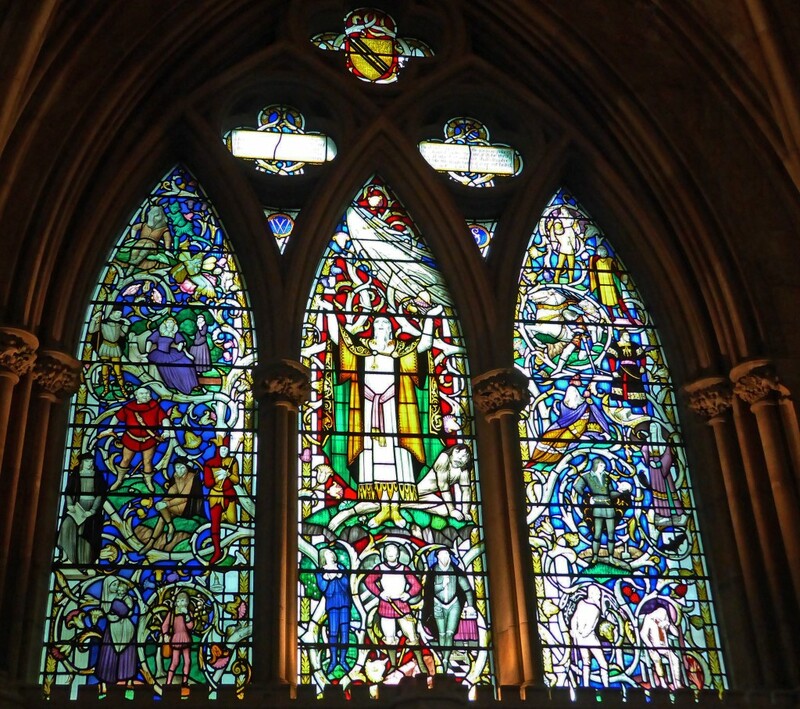 Entering the building, we encountered the memorial stained glass window dedicated to many of Shakespeare’s most well beloved plays, designed by Christopher Webb in 1954, with a reposing figure of the bard beneath. Shakespeare’s elder brother Edmund is buried in the nave and there is a memorial slab in the floor. We were treated to a wonderful organ recital whilst we were there, the decibels alone impressing with their sheer magnificence. Outside the group continued through the sights and smells of Borough Market. There has been a market on the site since at least 1014, and its millennium was celebrated in 2014. More formally it dates to 1756 when the Borough Market website reports that in February 1756 advertisements were placed stating that a “commodious place for a market is now preparing on the backside of Three Crown Court on the west side of the high street of the Borough and will be ready by the 25th March next for the reception of all country carriages and others bringing any kind of provisions to the said market.” Today it is a vibrant hive of busy stalls selling high quality food products, visited by serious buyers and tourists alike. 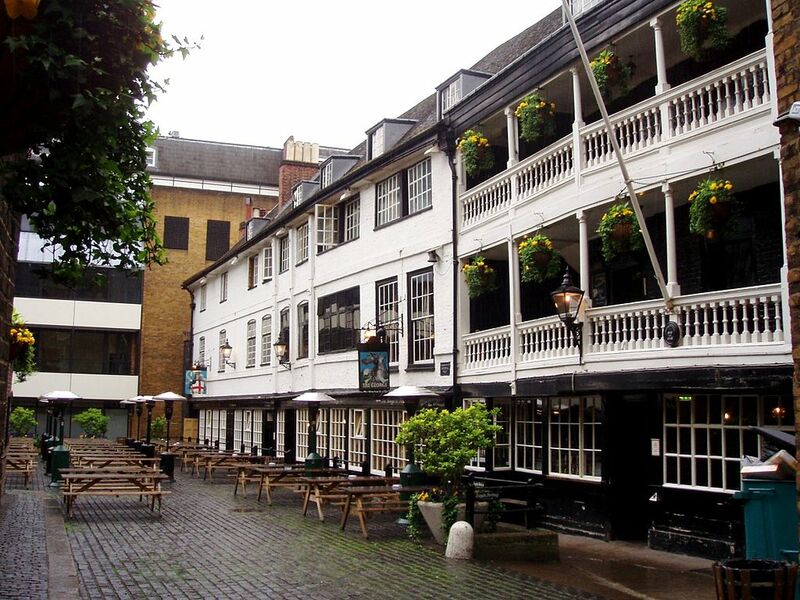 We wrapped up our walk with a visit to London’s oldest surviving galleried inn, The George, built in 1570. Although damaged by fire and having suffered the indignity of the loss of its north wing to the railways, the inn retains many original features and was frequented by Shakespeare, Marlowe, Pepys, Johnson, and thousands of their contemporaries. Today it rejoices in the presence of the likes of you and I, tired and hungry after a satisfying sightseeing expedition. With many thanks to Tony Keen for leading us through the winding streets of north Southwark and introducing us to so many superb insights into the Port of London’s rich and fascinating history and heritage. Shakespeare was a recurring figure in our travels, but the echoes of many other voices were heard too. This entry was posted in All, Guided walks on May 18, 2017 by Andie. 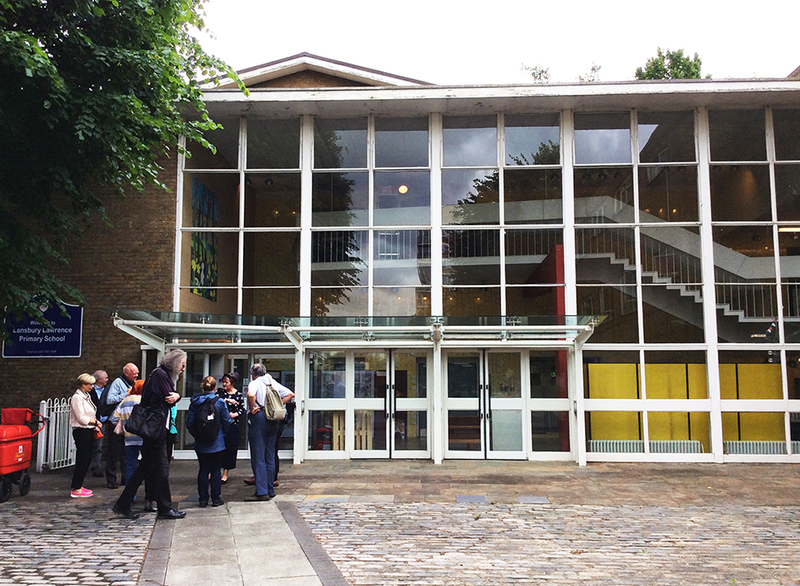 Ian launched our summer term of visits and guided walks with a fascinating walk through the old riverside districts of Ratcliffe and Shadwell, exploring the area around two parallel east-west roads, The Highway with its thundering traffic and the much quieter Cable Street. Our first stop was outside the Royal Foundation of Saint Katharine, a religious house founded by Queen Matilda in 1147, whose royal origins saved it from dissolution by Henry VIII. As some of us discovered, its café in a yurt in the grounds serves rather good coffee. We then passed artists’ studios in a former sweet factory, two charming rows of Victorian cottages and two late 18th century warehouses converted into flats – an early indication of the very mixed past and present economy of the area. We then walked through the first public park in Stepney, opened in 1922 close to Ratcliffe Cross where several 16th century explorers set sail in search of the North West Passage. This brought us to Shadwell Basin, the easternmost and best surviving part of the former London Docks, and Shadwell’s parish church, St Paul’s. The funeral of the Marr family, victims of the Ratcliffe Highway Murders. London Chronicle 1811. 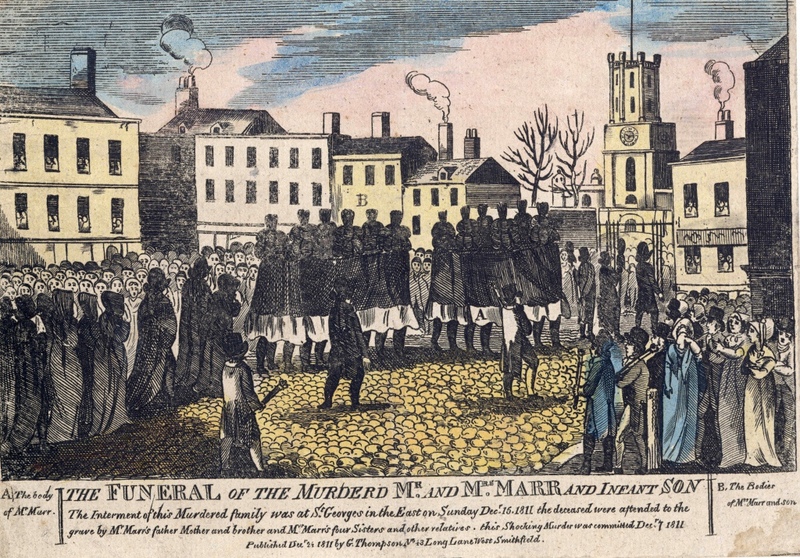 A little further west, we heard the gruesome story of the Ratcliffe Highway murders, which shook London in December 1811. A seaman was convicted posthumously of the seven very violent killings, but the evidence was flimsy and the truth has never been established. Walking on through the welcome greenery of the recently created Wapping Wood, we then admired the house where wealthy local brewer Henry Raine set up a free school for poor children in 1719. We speculated on the prospects for the Grade I listed warehouse at Tobacco Dock. When the docks closed, it was turned into a top-end shopping centre, but this was one of the slowest areas in Docklands to regenerate and the shops failed. Twenty years later it is being marketed as a business and events venue, but uptake seems slow. Back on The Highway, we came to the site of Jamrach’s Animal Emporium, set up in the 1840s to import exotic animals for onward sale to zoos and menageries. We heard the high Victorian tale of the tiger which escaped and captured a small boy. Thanks to the quick-witted bravery of Jamrach and his staff, the story had a happy ending. 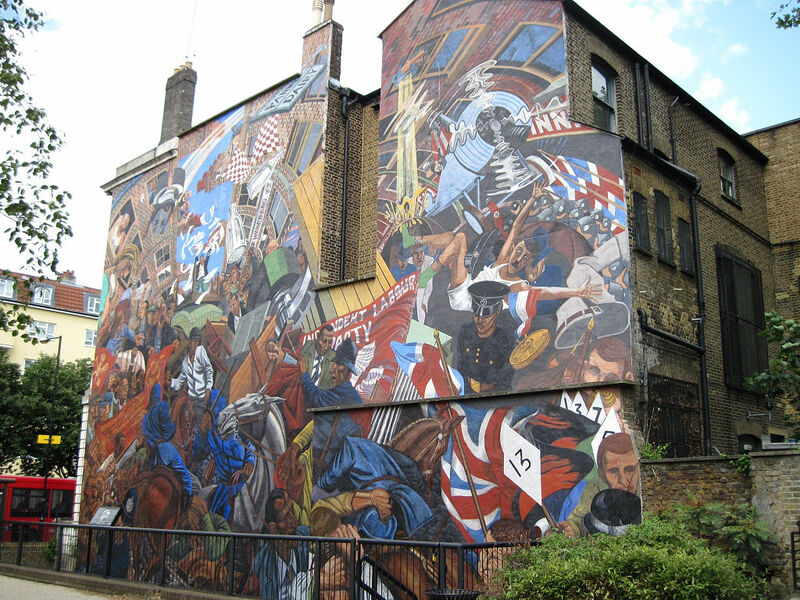 Modern mural of the Battle of Cable Street. By jo-marshall CC BY 2.0. We continued to St George’s in the East, a Hawksmoor church rebuilt within its shell after bombing in the Blitz. We were divided on the success of the new design. On the side of St George’s Town Hall, we admired the large mural which commemorates the 1936 Battle of Cable Street, when local people turned out in numbers to prevent a Fascist march from passing along the street. In Cable Street and Cannon Street Road, we saw houses and shops surviving much as they were in the early 19th century. By contrast, we then passed through the area where two fashionable squares were built in the 17th century: Prince’s Square, completely obliterated in the 1960s; and Wellclose Square, where the layout remains but the original buildings have all been lost. Our last two stops provided contrast. At the first we admired a survivor of the 1960s purge which destroyed the nearby squares: Wilton’s Music Hall, created out of a row of four houses in the 1840s and 1850s and functioning as a theatre today, though with a long period in between as a Methodist meeting hall, followed by decades of uncertainty and gradual restoration. The final stop was the site of a short-lived disaster, the Royal Brunswick Theatre, built in 1828 and demolished after collapsing three weeks later. The subsequent 1830 building, originally a seamen’s home, largely survives, alongside the 1890s home of the Mercantile Marine Office, which regulated the employment of seamen – a fitting reminder at the end of our walk of the maritime origins of the area. Our many thanks to Ian for all his research and planning, and for a very enjoyable and informative guided walk. 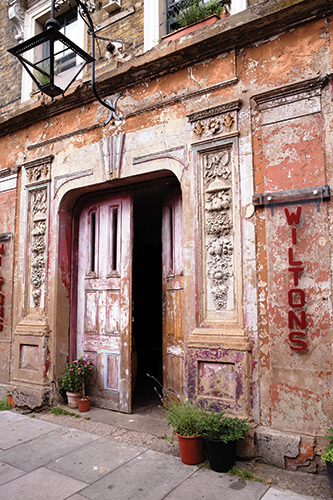 The front entrance to Wilton’s Music Hall. Photograph by James Perry CC BY-SA 3.0. This entry was posted in All, Guided walks on May 9, 2017 by Andie.